"As a family we vacation in Orlando nearly every year and stay at a timeshare property and hotels, it would be nice to own something that we can call our second home. I believe we would like to construct a second home which we would use to vacation in every year and which family/friend could also stay in." 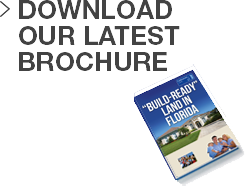 "[Fairhomes is] well known, trusted. They seem to know what they are talking about. Experienced." "I would like to believe that the global recession has hit an all time low and that things can only get better." All quotes are independent, are provided for information only and may not be representative of Fairhomes´ views.